Information, in the form of corporate documents and records, is one of the most vital strategic and operational assets of an organization. Efficiently managing these assets is essential for effective governance, risk management, reputation protection and strategic decision-making. Achieving this control, however, is a difficult challenge for many companies because they lack effective policies and procedures to manage critical corporate records and other business documents. 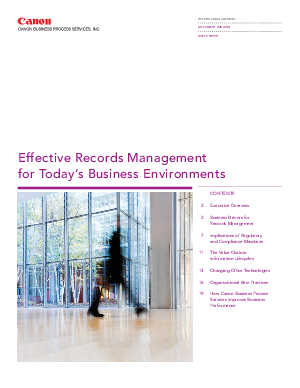 This whitepaper looks at how to develop, implement and maintain an effective records management strategy and program to enforce enterprise-wide information management policies; how to reduce exposure and risk when managing your firm’s records while meeting compliance requirements; how to protect your firm from unwanted litigation related to records management; and how to achieve records management best practices and reduce costs using a proprietary, innovative methodology.